German dishes shine when served with their traditional sides. Typical German suppers, served at 1 pm, include fresh fruit or compote for dessert ​and leave the cake and other sweets for coffee time late in the afternoon. This is a good way to eat and not overeat, especially if you visit Germany. A popular German saying is "Nach dem Essen soll man ruhen, oder tausend Schritte tun", which means "After eating, either take a nap or a walk". This is another reason the German obesity rate is not as high as in the US. Roasts are the perfect Sunday Supper. After you brown them, you have plenty of time while they cook in the oven to finish the rest of the meal. Make a simple soup for "Starters", then serve the roast with potatoes and leeks sautéed in butter until soft and finished with cream and freshly grated nutmeg. If you want a dessert, make it a light pudding or mousse, served with fruit. Sometimes there is nothing better than good, old-fashioned comfort food. Like the comfort food Grandma used to make. Try one of these roulade recipes (rolled cabbage or beef) and serve it with boiled potatoes and steamed cabbage, Brussel sprouts or sauerkraut. Living in the Black Forest for a year taught me to like "Lentils, Frankfurter and Spätzle". The lentils are cooked with German bacon and soup greens and served with red wine vinegar. To this, you add Spätzle, a type of noodle, and sausage. Germans usually buy the long hot dog-like Frankfurters called "Saitenwürstle" or "Wiener". Try this recipe for authentic German Linsen, Spaetzle, und Saiten. What's more famous that the humble German Cottage Potato? Bratkartoffeln are served in many ways but one of the easiest, but the most satisfying way is with a green salad and fried eggs (Spiegeleier). If it's hot outside or you don't know when you'll be eating, make these hamburger patties ahead of time and serve with a salad or two. Don't dress the lettuce salad until you are ready to eat, but everything else can be ready to go. Try Lentil Soup or Barley Stew with a thick slice of homemade Bauernbrot or bread for a simple meal. 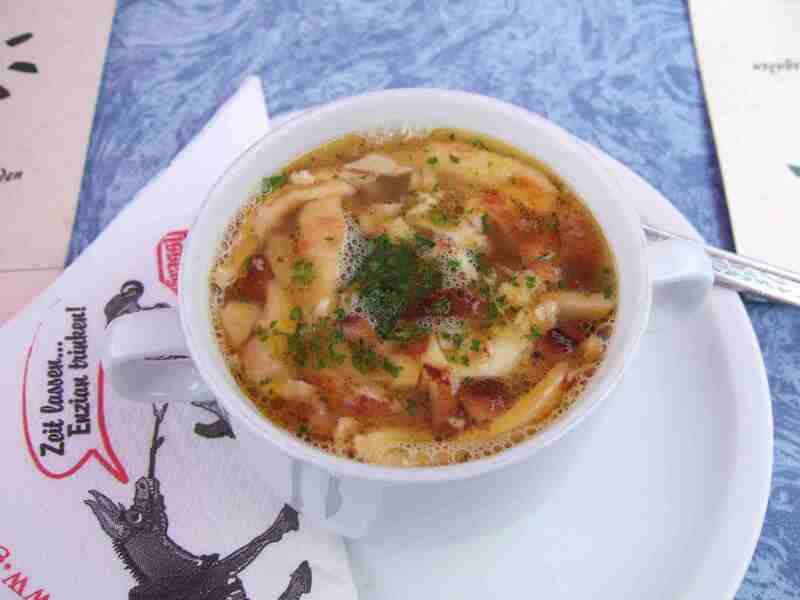 Often served in the "Kantinen" and "Mensas" (Cafeterias) in Germany, this soup has veggies, potatoes, and lentils in it, as well as sliced sausage. Make a fresh loaf of German-style bread for a filling and healthy meal. If you freeze part of the loaf, you don't have to bake next time you make this menu. German main dishes can be sweet rather than savory. Lots of carbohydrates for plenty of energy on cold days and filling to boot, that's what sweet main dishes serve up. Often served with a fruit or ​vanilla sauce, a plate or two of these dishes with a hot glass of tea has protein, too to keep you full. Sometimes these sweet dishes are served with a little soup to start.